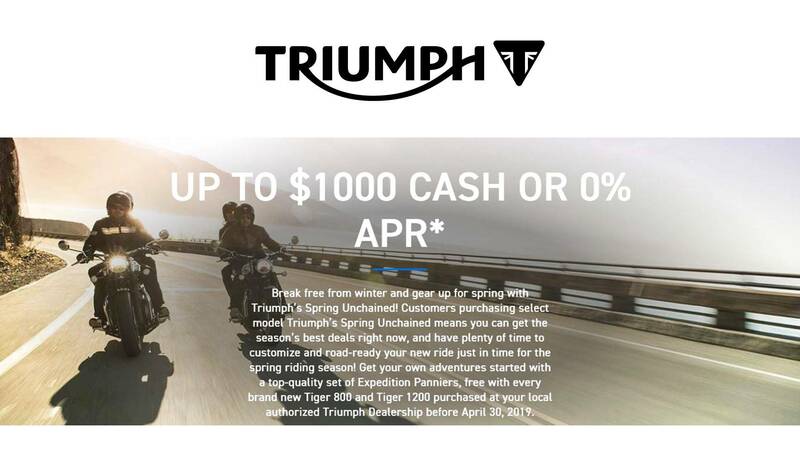 $750 Triumph cash or rates from 1.99% ex 3/31/19. Accessorized bike with detachable canvas bag, comfort seat and much more! Born for freedom and fun - better in every way. Ready for every road. The Street Scrambler has been designed to deliver a more purposeful and beautiful Scrambler style, with unique features and detailing. Sharing the same contemporary custom principles as the Street Twin, the Street Scrambler has the iconic Bonneville silhouette combined with clean lines, minimal bodywork and contemporary finishes and sleek fuel tank. 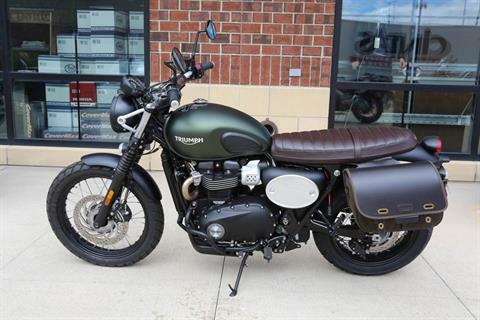 Completing its distinctive style are a host of purposeful scrambler features, including an interchangeable pillion seat and aluminum rear rack, removable pillion pegs and hangers, adventure style front pegs and bash plate. 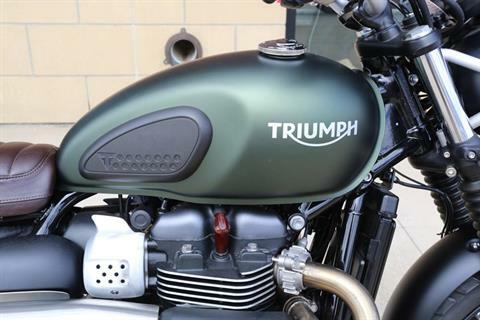 The dedicated Scrambler chassis has longer rear shocks, a 19 inch front wheel, wide handlebars and a low seat height. 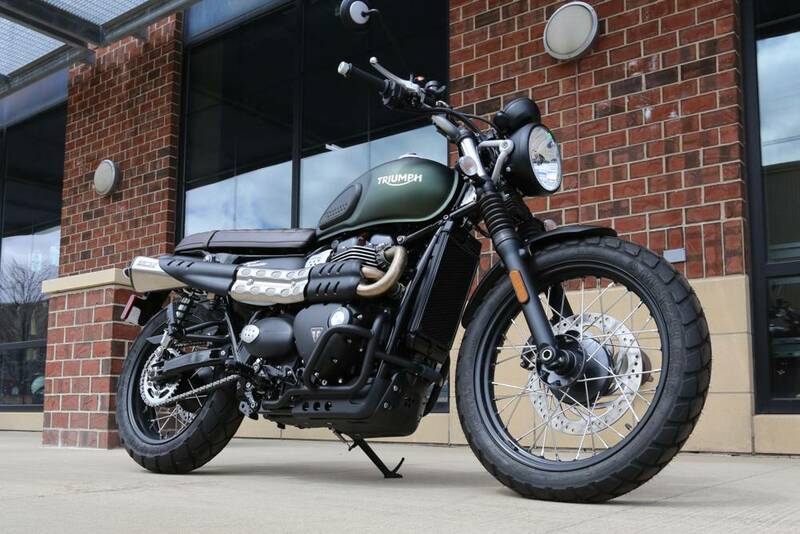 Fitted with Metzler Tourance tyres, the Street Scrambler is designed to deliver real capability and control on every type of road. With an accessible seat height, commanding upright riding position, sure handling, wide handlebars, rider-focused-technology and over 150 stylish accessories, the Street Scrambler is fun, accessible and ready to personalize. 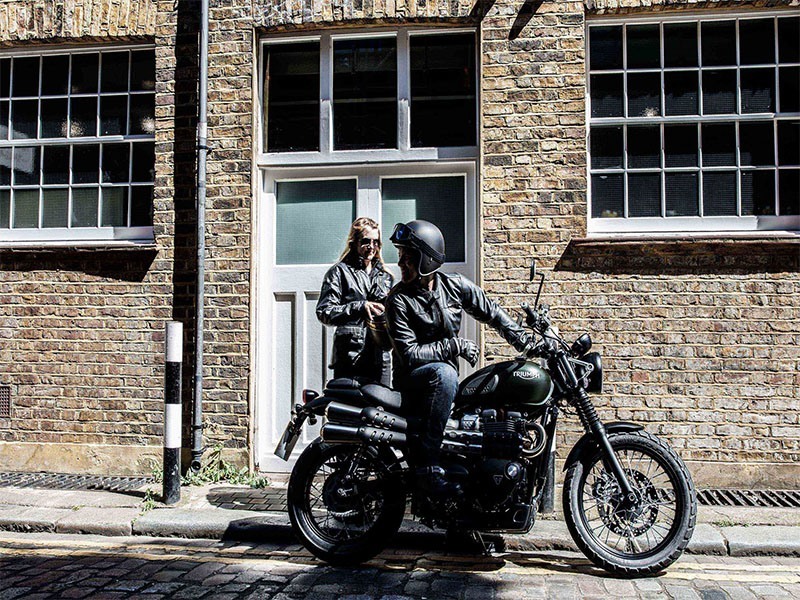 STRIPPED BACK CUSTOM STYLING: The Street Scrambler is built on the unmistakable Bonneville silhouette and iconic styling cues, with clean lines, minimal bodywork and contemporary finishes. The Scrambler’s custom styling includes an elegantly shaped fuel tank, black sculpted engine covers and stylish engine badge. It also features a single throttle body with aluminium finisher, minimal side panels and rear mudguard, signature clean line ‘hidden cat box’ pipe run, brushed headers along with finned head and header clamps for that contemporary Bonneville look. The Street Scrambler is available in three exciting paint schemes. DISTINCTIVE SCRAMBLER FEATURES: The Scrambler's distinctive features include: Ribbed Alcantara-style seat, with contrast stitching and Triumph embossed logo. Interchangeable pillion seat and elegant laser cut aluminium rear rack for even more practicality. Removable pillion pegs and hangers, ‘Bear Trap’ adventure style front footpegs, uniquely detailed knee pads, aluminium headlight bracket and black headlight bezel, all-terrain style bash plate and number board side panel. 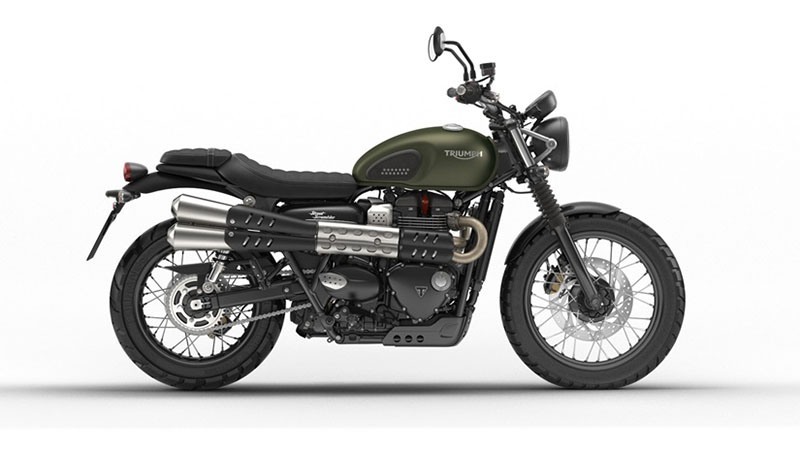 PREMIUM FINISHES: The Street Scrambler is crafted to the highest of standards with a host of premium finishes, including real brushed aluminium tank decals, gun-metal finish engine badges and dedicated scrambler mirrors for better visibility. There are three exciting paint schemes to choose from; Jet Black, Matt Khaki Green and a twin colour scheme Korosi Red / Frozen Silver, finished with jet black hand painted coach lining. MORE CAPABILITY - CHASSIS AND SUSPENSION: With a dedicated chassis and suspension the Street Scrambler is now even more capable, with a more dynamic scrambler poise, commanding riding position, sure handling, great accessibility and a host of unique equipment. The Street Scrambler chassis set-up is tuned to deliver a neutral and predictable ride. This, combined with a confidence inspiring evolution to ‘stand-over’ ergonomics for manoeuvrability and low seat height, makes it a really accessible and fun bike for every type of rider, delivering maximum confidence and control. 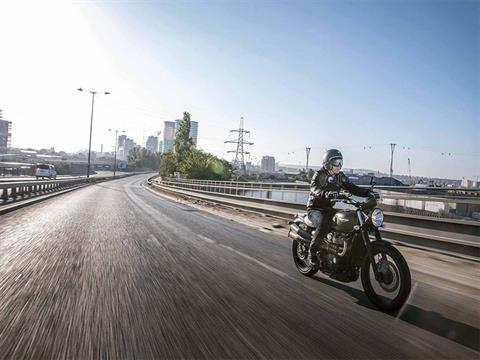 DYNAMIC SCRAMBLER ERGONOMICS: To live up to its name and rider expectations the Street Scrambler has been developed to deliver more scrambler focused ergonomics, without compromise to everyday riding comfort. Compared to the Street Twin, this includes a main frame and chassis set up with wider handlebars and more forward set footpegs. This, combined with dedicated longer front and rear suspension and bigger 19 inch front wheel, delivers a commanding riding position for urban and open road riding and a great, light off-road, riding position. DEDICATED SCRAMBLER SHOCKS AND FORKS: The Street Scrambler has longer model specific rear suspension units (RSU’s), finished in matt black, lifting the rear end for additional ride height. There are also model specific front suspension forks that are longer than those on the standard Street Twin, providing increased ground clearance that lives up to its Scrambler name. The front suspension forks come with traditional styled rubber fork gaiters. WHEELS, TYRES AND BRAKES: Contributing to the Street Scrambler’s commanding riding position and signature silhouette are classic wire spoked wheels. The Scrambler has an impressive 19 inch front wheel and 17 inch rear wheel, both with stylish steel blacked out hubs and rims. Dual purpose Metzler Tourance Tyres provide great grip and light precise handling, making riding easier whatever the weather conditions or road surface. Developed for modern street orientated enduro bikes, these tyres provide maximum mileage on the street and great traction on light off-road surfaces. 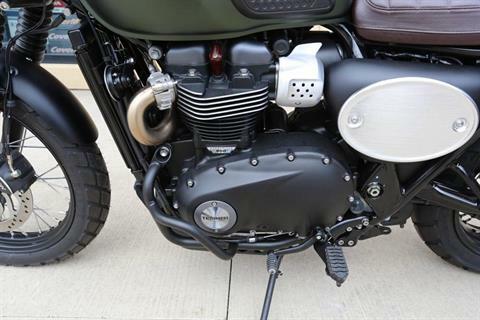 The Street Scrambler is also fitted with a twin piston sliding axial Nissin front caliper with machined branding. 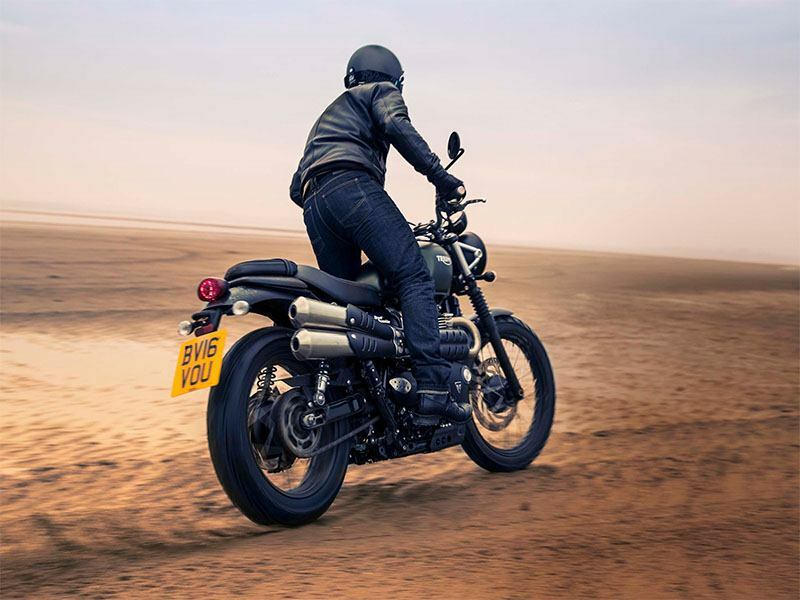 THRILLING PERFORMANCE, SOUND & RIDING EXPERIENCE: The Street Scrambler’s engine, exhaust and rider-focused-technology, boasts several major enhancements over previous generations, offering more performance and a better riding experience. 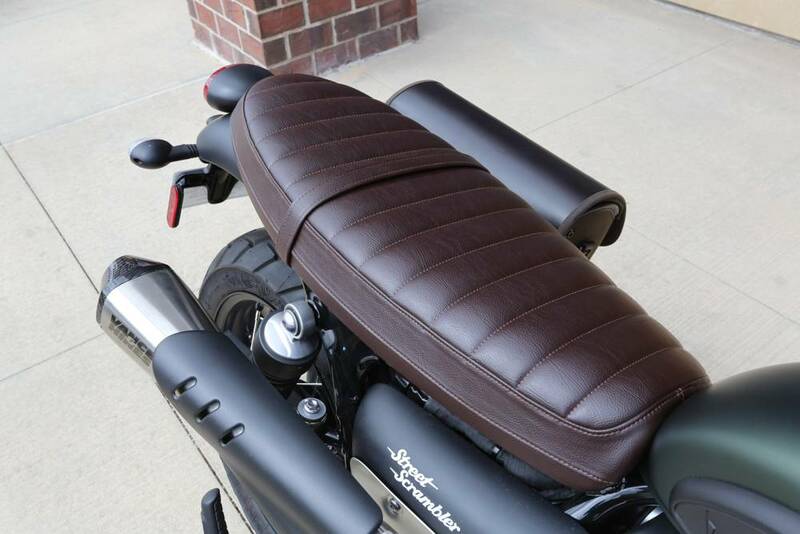 Technology enhancements include switchable ABS - a unique feature for the Street Scrambler. CRITICALLY ACCLAIMED 900CC ‘HIGH-TORQUE’ ENGINE: The Street Scrambler features the same critically acclaimed 900 cc high-torque Bonneville engine as the Street Twin, delivering thrilling performance and enhanced fuel economy. The 900 cc engine has an 8 valve single overhead camshaft parallel-twin with 270° firing interval for a smooth, linear power delivery from the slick five-speed gearbox, and has been specifically tuned to deliver much more torque and power low-down and in the mid-range - just where you need it. 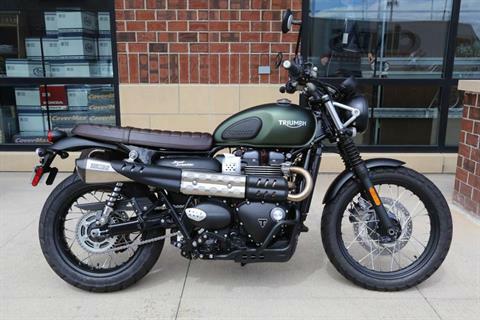 THRILLING SCRAMBLER SOUNDTRACK: The Street Scrambler features an all compact twin high-level exhaust system with brushed stainless steel headers that follow a beautifully crafted flowing line. 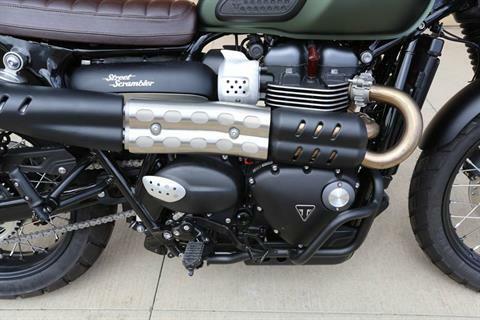 The intricate header run cleverly integrates the cat box invisibly between the heat shield and the engine barrel and is finished off with brushed stainless steel silencers and contrasting stylish black heat shields. Just like all the Bonnevilles, the Street Scrambler's exhaust is tuned to deliver a rich and full British Twin Scrambler soundtrack. 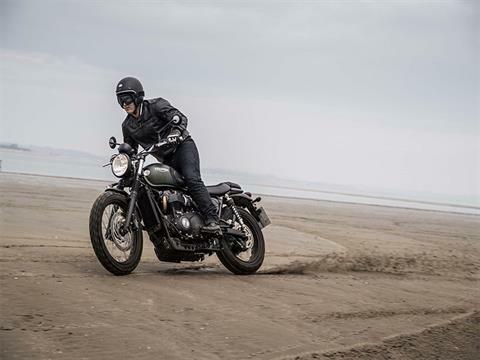 PERSONALISATION AT HEART: Just like the Street Twin, the Street Scrambler has been designed with personalisation at its heart. With more than 150 accessories to bring more rugged off-road focus and performance, more style and more everyday usability. 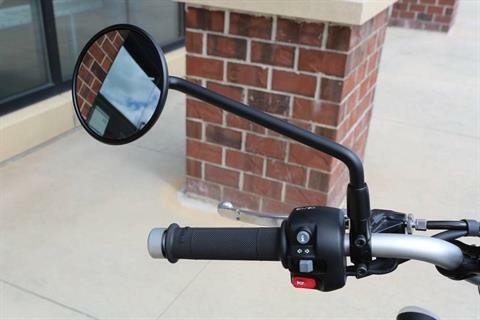 MORE RUGGED OFF-ROAD FOCUS: There are a number of accessories available to enhance the off-road focus of the Street Scrambler. These include adjustable rear Piggyback FOX shocks with threaded preload adjustment and 24 position compression damping, a larger internal piston and external oil reservoir and a black glass filled nylon headlight grill, with a pressed steel matt black finish bezel. Also available is a forged and machined aluminium handlebar brace, finished in anodised black, with a stylish brown vinyl bar pad embroidered with the Triumph logo and premium pressed aluminium left hand side number board panel with a clear brushed finish. 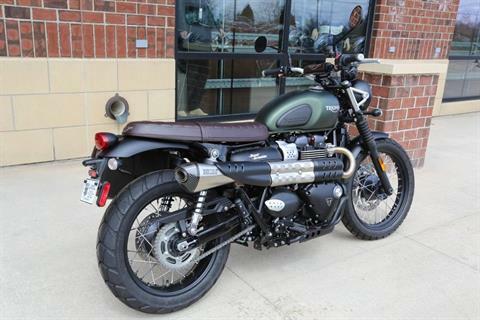 MORE STYLE: There are plenty of accessories available to add even more style to the Street Scrambler. 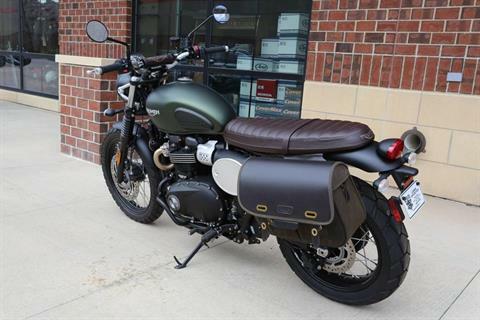 These include slip on Vance & Hines single exit silencers with a carbon fibre reinforced polymer end cap, traditional scrambler twin bench seat and bar end peep mirrors with laser etched Triumph logo - available in anodised black or clear aluminium. MORE EVERYDAY USABILITY: For everyday usability the Street Scrambler has: Internally wired heated grips, with an integrated dual temperature control button in the left hand grip. Steel fabricated centre stand kit in black powder coat finish, including ‘up stop’ to work with the high level exhaust. Auxiliary power socket and cockpit mounting kit. 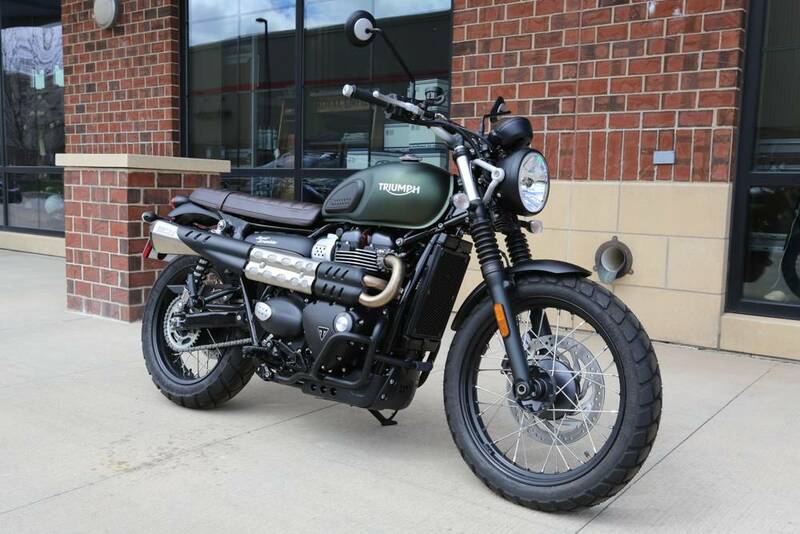 RIDE BY WIRE: The Street Scrambler’s electronic ride-by-wire system enhances throttle response, providing smooth and precise drive for a higher level of control and rideability. 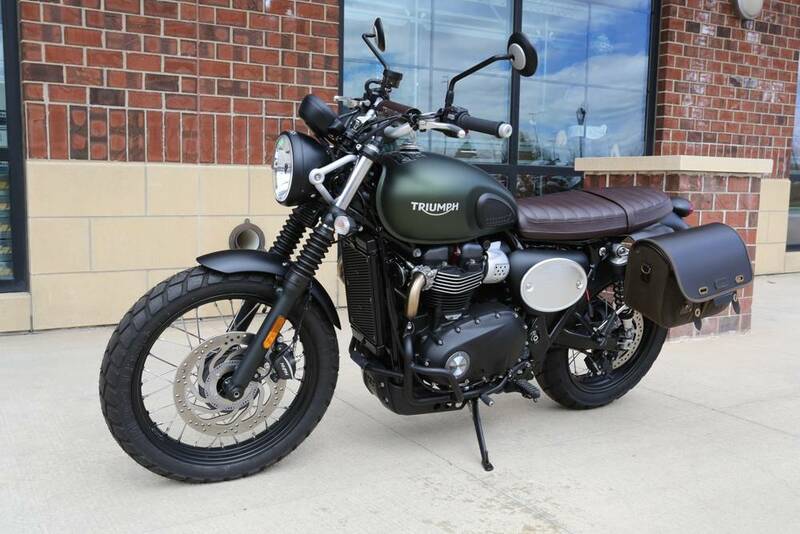 SWITCHABLE ABS: Triumph’s anti-lock braking system brings an advanced level of control and safety to the Street Scrambler, with minimal visual impact. The ABS can be turned off via the instrument menu, which is a unique feature for the Street Scrambler, reflecting its genuine dual purpose capability. SWITCHABLE TRACTION CONTROL: The Street Scrambler incorporates a switchable traction control system that optimises the delivery of torque when traction is compromised to maximise rider safety and control. TORQUE-ASSIST CLUTCH: The Street Scrambler’s torque-assist clutch system reduces the clutch packaging, allowing for a narrower engine profile. 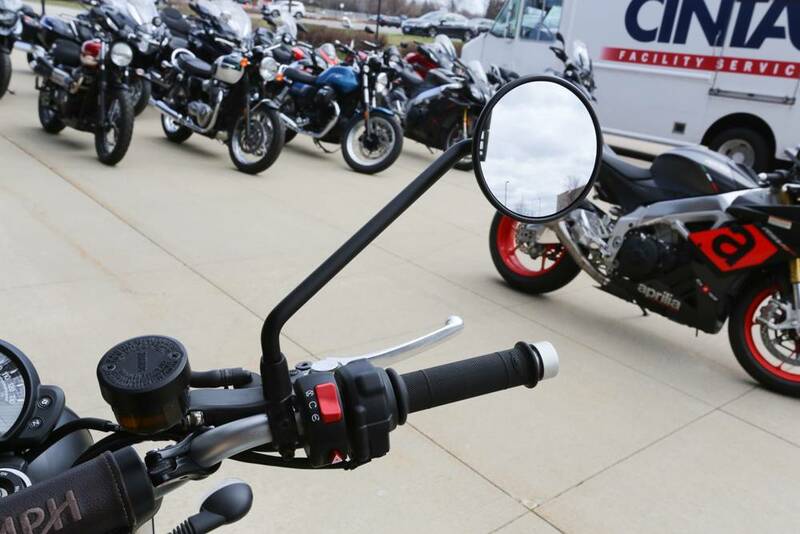 It also brings a light touch and feel to the clutch control, helping reduce clutch lever effort for the rider, making it easy to ride. 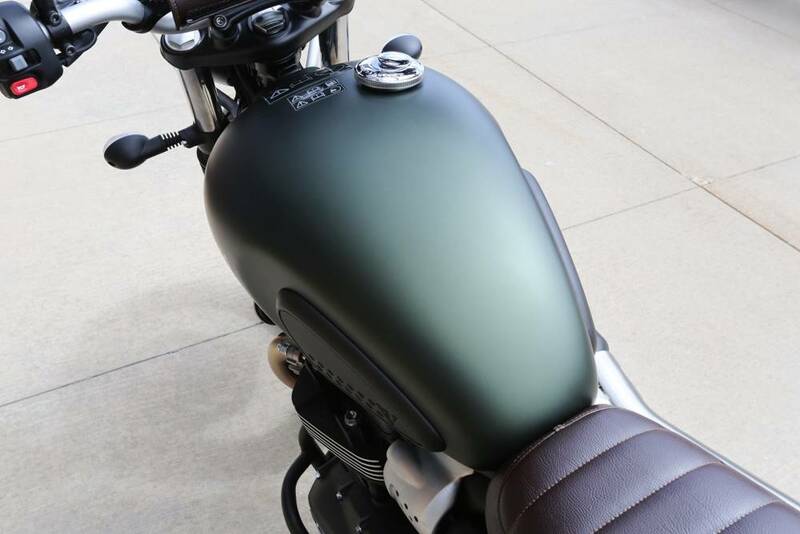 LED REAR LIGHT: The LED rear light has been incorporated into a compact and elegant tail set-up that gives the Street Scrambler a distinctive light pattern and greater power efficiency for long term durability. 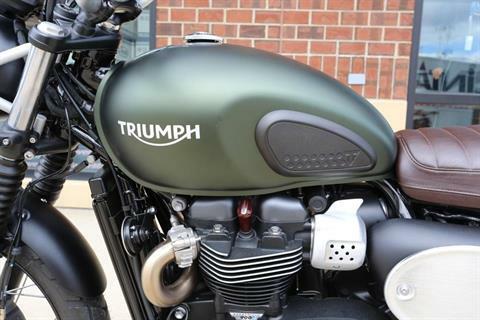 ENGINE IMMOBILISER: The Street Scrambler includes a Thatcham approved security device that integrates a transponder into the Street Scrambler’s premium finished key. This is linked to a receiver in the ignition system to prevent the engine from running without the correct key present. USB CHARGING SOCKET: An under-seat socket is provided for convenient charging of your essential devices. Front - 36-spoke 19 x 2.5 in. Rear - 40-spoke 17 x 4.5 in. 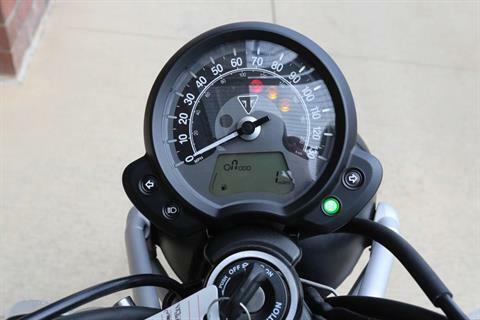 LCD multi-functional instrument pack with analogue speedometer, odometer, gear position indicator, fuel gauge, range to empty indication, service indicator, clock, 2x trip, average & current fuel consumption display, traction control status display, TPMS ready & heated grip ready - controlled by a handlebar mounted scroll button (accessory).